In case you were busy settling up with Alamo Rent A Car after just driving, man, went horribly awry, here’s what you missed in sports on Wednesday. The Los Angeles Lakers’ troubled season continued, as forward Pau Gasol has been ruled out for at least six weeks after tearing his plantar fascia. Back in the Lakers’ locker room, a frustrated Mike D’Antoni was confused by the diagnosis. “Oh, first Dwight is in and out of the lineup with undiagnosable shoulder pain, and now Pau tears a damn ribbon, and he won’t play?” said D’Antoni, whose native tongue is Italian. “No, coach,” interjected Lakers point guard Steve Nash, “I’m pretty sure fascia in English refers to the frieze of a building. Or like, the space around a column? His home must have suffered some cosmetic exterior damage, and that can be a real pain to deal with.” D’Antoni countered, “Well, that’s no reason to miss six weeks; with the amount he’s paid, that’s one week out tops.” Metta World Peace then chimed in: “I don’t mean to be a bother, but fascia can also mean ‘bandage’ in Latin. Perhaps we should give the Spaniard the benefit of the doubt and assume that he ripped a bandage, and then got one of those antibiotic-resistant infections.” A dark hooded figure then emerged from the corner of the room, and bellowed, “Stai zitto!” A hush fell over the room until World Peace asked, “What’s that mean, Kobe?” Bryant, deflated, responded, “It means ‘shut up,’ Ron. In Italian. Man, why’d you have to ruin my badass entrance. Whatever. 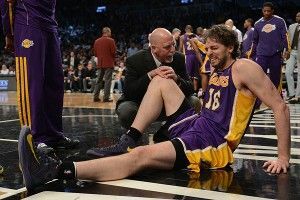 All that matters is that Pau is feeling pain. Do we know whether or not he’s feeling pain?” At this point Gasol himself got up from the trainer’s table and said, “Uh, guys, I’m right here, and it’s just a foot injury. I should be back in March.” But his rational explanation came too late, as Kobe had already decided he was owed pain. The San Antonio Spurs, despite missing Tim Duncan and Manu Ginobili, won their 11th straight game, beating the Minnesota Timberwolves, 104-94 on the road. After the game, Spurs point guard and Frenchman Tony Parker mused, “I do not miss my fellow Spurs, for to miss is to long for an absence, to be no more than a dog longing for its dinner.” Parker then pulled a Gauloises out from behind the ear of a reporter and said, “Yes, I am magic, but the real magic lives in the heart of a child, right after he sees that death is real. Perhaps that comes when he finds his favorite bird devoured by a hungry dog, for then he has become a man, and so he is not a child, which means there is no real magic.” Parker then disappeared in a cloud of smoke, which cleared to reveal an adorable French Bulldog sitting in Parker’s locker, chewing on a Gauloises. Americans fail to qualify for the 2014 World Cup in Brazil. The Johnson Prophecy hath been writ. Shall it be fulfilled? Alabama followed up its second straight BCS National Championship by finishing at the top of the football recruiting rankings for the second consecutive year after a solid showing on National Signing Day. Head coach Nick Saban credited his team’s success to his four recruiting principles: hard work; single-minded focus; finding a hate in your heart so deep and black that sleep, food, and love become mere afterthoughts in the hellscape that is your damned existence; and using the Internet to broaden the talent base you’re drawing from. Arkansas recruit Alex Collins could not commit to the Razorbacks on Wednesday after his mother, Andrea McDonald, refused to co-sign his letter of intent, hoping to persuade her son to stay closer to home and play for the University of Miami. This marks the first time that a mother has hoped her son would play football for the University of Miami. A rare baseball card from 1865 depicting the amateur Brooklyn Atlantics baseball club fetched $92,000 at auction on Wednesday. The card, which is not the near-mint 1989 Upper Deck Ken Griffey Jr. rookie card sitting in a binder at my mom’s house, is one of two known copies of the Atlantics card in existence. The other resides in the Library of Congress, and not in a binder in my old closet marked “Best Mariners’ Cards DO NOT TOUCH!!! !” Cards from that era featured the entire team, and not just one future Hall-of-Famer who managed to escape the steroids era with over 600 home runs and an untarnished image. The seller, who wishes to remain anonymous, was pleased with the final price, and is not me.